It’s been quite a long time since i sat down and read a graphic novel. I’ve felt like i haven’t had the time to sit and read one in one sitting (which is what i usually do) so i’ve ignored that section of my book shelves all together. 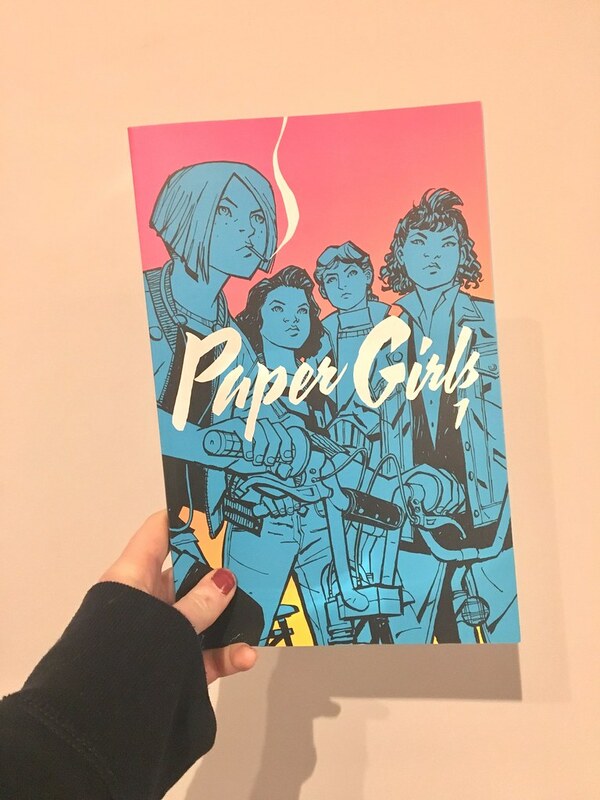 However, i sat down with Paper Girls after having it on my shelf for over a year, finally. I didn’t know much of the story going in to it. I saw someone discussing it recently and it was the push i needed to pick it up. The jist of the story is a group of Paper Girls trying to figure out where everyone in their town is disappearing to, and who the invaders of the town are. It’s set in the 1980’s which brings a very retro vibe to the story and made it incredibly enjoyable. With the hype around shows such as Stranger Things at the moment, it felt like the perfect time to pick it up. I really enjoyed the artwork of the graphic novel, and to be honest it was the only reason i was so eager to pick it up in the first place. There is a lot of block colour and cartoon like drawing which i like very much in graphic novels. In regards to the story itself, i found it was lacking a little in something. That something i’m unsure what it is. It threw the reader right in to the story with little warning or setting up of situation or characters. It was a ‘jump in and figure it out’ kind of thing, which i’m not fond of in a story. The first issue feels to be setting up for something a lot bigger as not that much was explained about the situation the characters found themselves. Down to the aspect of the characters first meeting in the first few pages and not much is explained as to why they seem to already be aware of who each other are. It left me a little bit confused. The sparse writing meant that it was very fast to get through. I sat down and read the whole thing within an hour, which is how i like to read graphic novels. It’s easily digestible and somewhat easy to follow (with the small amount of information you get) which means it’s perfect for first time graphic novel readers. It also has a really great feminist vibe to it which appeals to a lot of people.